Are you ready to plant your garden, but are feeling a little unsure of how to lay it out? Well, it seems everyone faces that dilemma each year. 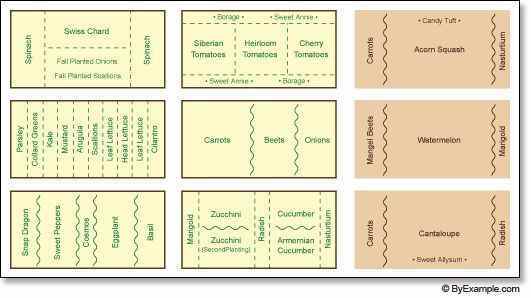 The reason is that there are so many different ways to lay out your garden. Then you have to consider what your goal for your vegetable garden is. Do you want it to give some produce but also care about aesthetics? Are you more interested in getting the most produce possible from your garden? 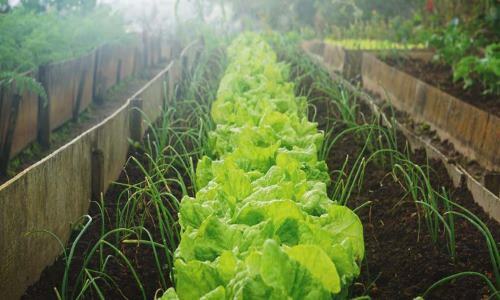 After you decide what your primary goal for your vegetable garden is, then scroll through the garden designs I’ve gathered from all over the internet and see which options work the best for you. These plans are amazing. The reason is that they take each raised garden bed into account and lay it all out to scale. Then you can see that they incorporate the purpose of each vegetable as well. For instance, you’ll see they are growing multiple beds of tomatoes. However, they label the tomatoes that are meant for sauce, the tomatoes meant for sandwiches (or slicers), and also incorporate the other vegetables they plan to grow in smaller amounts. Which is why this thorough layout would be a great place to start if you are planning on gardening in raised beds this year. 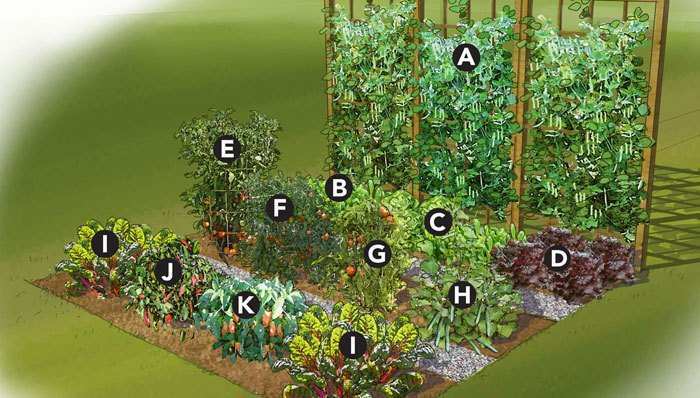 If you want to grow a smaller garden, then you might want to consider this method. You have one raised garden bed. Then you put a pallet on the backside of the bed to allow vegetables to grow up it for support. This should be a frugal option as well. From there, you’ll need to know how to make the most of your garden bed. 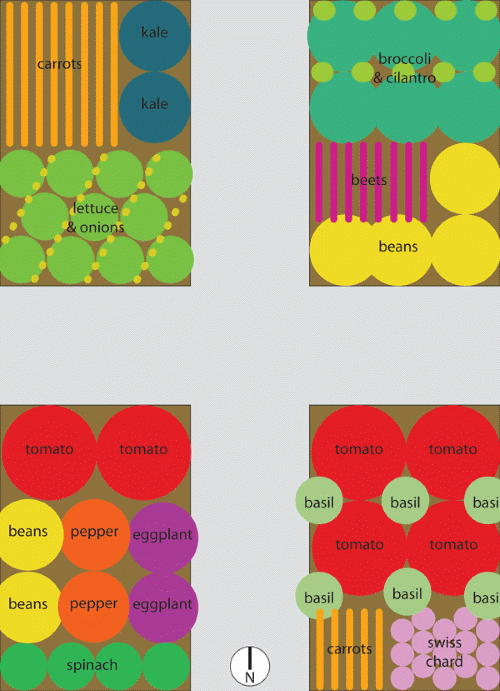 This layout gives you a square for each vegetable grown. As you can see, you can have quite a variety of vegetables growing in one bed. This would be an excellent option for those who live in suburban areas with smaller yards. This garden plan is another exact layout. It incorporates multiple beds. This means that you can grow a ton of food and different varieties, too, because they won’t be in the same bed. Which is great because you can grow everything from vegetables, to flowers, to large sunflowers in one garden. Also, it offers a plan for companion plants as well. You’ll notice that when you see a mixture of vegetables and flowers. People usually do this to keep pests at bay, but be sure to do your research to check for accuracy. Do you need to grow a lot of food? I understand because I have to produce a ton of food every year to feed my family. However, it can be challenging to plan out where everything should go. Thanks to this layout, it doesn’t have to be complicated this year. In fact, you can see where she has made room for everything from vegetables to fruits to nuts. You name it; you can probably find a way to make it work in this garden. If you are interested in making your own food then click here to find out more about this awesome survival guide on food independence. I am in love with this garden plan because it looks neat and tidy. It also doesn’t waste any space when filling in the garden. However, it doesn’t look overcrowded. It has a nice balance to it and seems like it would be easy to maintain. 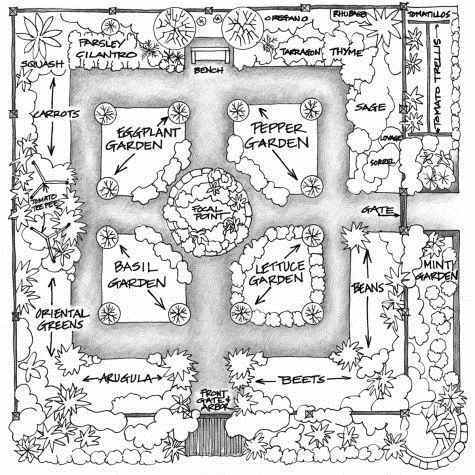 When you need a garden plan that will hold a lot of food and look good too, then you’ll want to consider this layout. 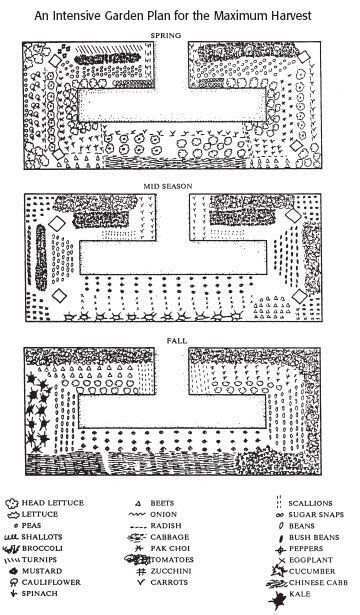 This is another garden plan that I love. The reason is that it has the garden layout for spring, summer, and fall. Also, I like how it can fit a lot of variety into one medium sized garden space. However, the drawback is that the image has a key that you must translate. That isn’t all that difficult, but it isn’t as simple as some either. 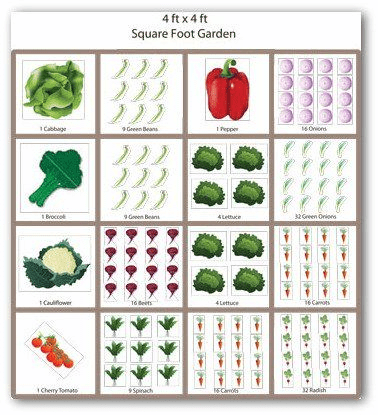 Square foot gardening is a great way to be able to fit a variety of vegetables into one vegetable garden space. Which is why I love this layout. Also, I love how plain the design is. It is easy to follow and see what is going on. It makes planting a small garden very simple. 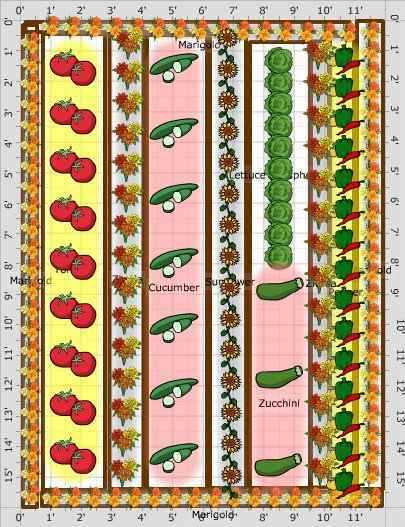 Plus, it also shows you proper placement of vegetables to keep everything from overlapping or stunting growth. 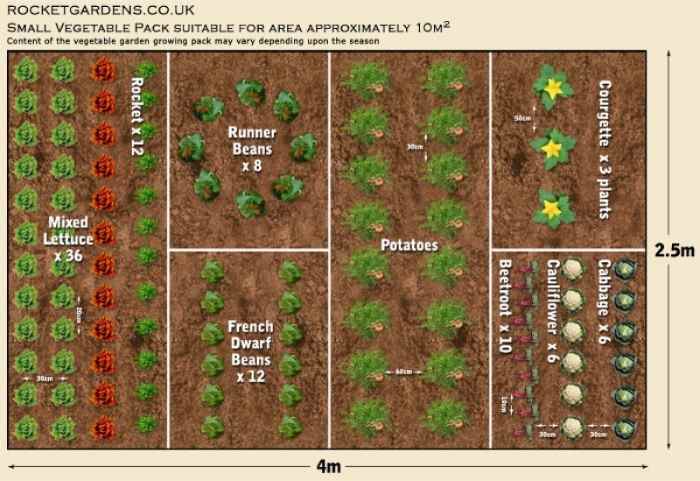 Are you working on a smaller plot and need to know how to arrange everything? This plan is for you then. This design includes everything from vegetables to herbs. It also looks nice, since you have the shorter items in the front. Followed by the taller and cascading items in the back. It would add some charm to your yard. 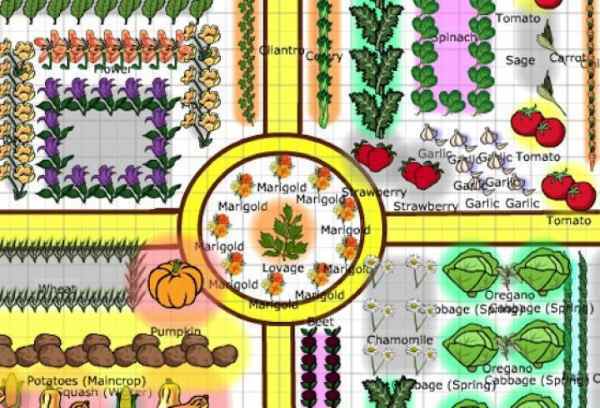 If you are stumped as to how you should arrange your fall garden, then check this plan out. It is easy to read and includes all of your necessary fall vegetables. But my favorite part about this design is that it includes everything in a lot of detail. You have the trellis where you are supposed to grow peas. Then you have lots of fresh greens and carrots thrown in the mix as well. It is a great design that embraces simplicity. This garden design has a lot of detail included in it as well. You can tell that the creator had the thought of aesthetics and not just production. But if you live in a suburban area, then you know that how your garden looks can often matter to those around you and your HOA. Which is why this layout might be conducive to many. Also, it includes lots of fresh vegetables that are spread out uniquely. Auntie Dogma knew what she was talking about when she created this garden layout. It is effortless to read, and she explains why she chose to place items in certain places. But if you are also looking for a helpful resource on growing and planning your first garden, then this could be a useful resource. Whether you need background or just a garden design idea, most will find this a valuable resource. I already mentioned a little above that many people plan out their garden using companion planting. This is when you plant certain plants together that will compliment or protect each other just by being in close quarters. Well, this is what this layout is all about. They tell you which vegetables they are growing this year and where they will plant. Then they show which plants compliment each other (or are companions) and build an entire layout from that standpoint. This resource doesn’t give you an actual layout to work from. It does, however, give you tips on how to properly plan your garden layout. With that in mind, I felt it was still worth including in this post because many people want to create their own layout, but need some pointers are where to start. If that is you, then you’ll want to check out the tips and begin building a layout that works for your location. 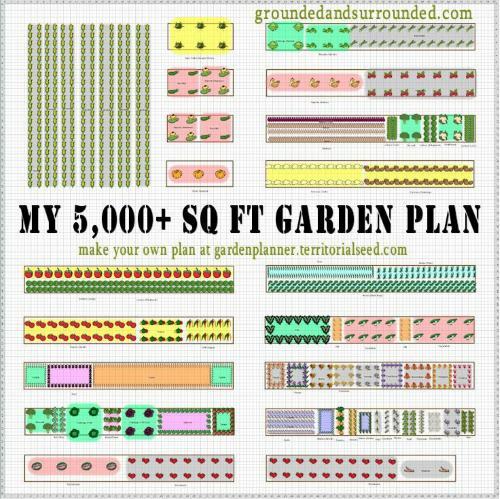 This layout (the way it is illustrated) looks like the first garden plan I shared. It is different in some ways. First, many more vegetables are included in this garden design. This is great news if you are someone that wants to grow more variety in your garden. Then I like that the tomatoes are included in multiple beds, instead of lumped together. It all depends upon your gardening goals and preferences. 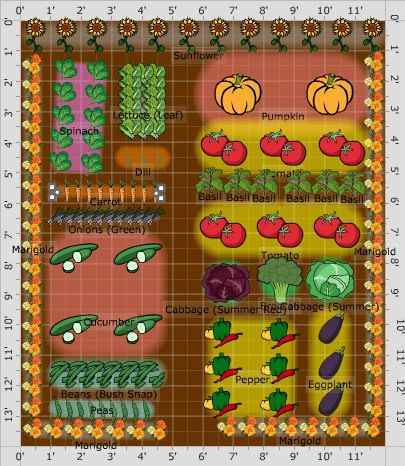 This garden plan is a great one. I love the way they created it visually because it makes it easier to follow. Also, I’m a fan of the fact that they included both flowers, vegetables, and herbs in a unique garden design. Finally, I love the incorporated walkway all the way around it to make it easier to get to and care for the plants. If you are someone that is new to creating or following a garden design, then you might find this option useful. To start, it is very easy to follow. The graphics are simple. There is no key to understanding it. Also, it is created in a way that is simple to read. But it also incorporates a variety of vegetables and fruit. I love the fact that it includes hanging baskets for smaller greens as well. This layout is more difficult to read, in my opinion. You can see the names of the vegetables, but it just isn’t as apparent as some of the other plans shared. However, the layout itself still should work quite well. You should be able to fit a variety of vegetables into a small gardening space. Then you can have a beautiful and productive garden this summer. I’m a fan of this type of garden design. I think it is easier to read for those that are looking to duplicate the idea. Which means, if you need a design that will be easy to follow, then you’ll want to check this one. Also, I love the fact that they have marigolds going all the way around it. It adds protection to the plants and an additional element of beauty to the garden. This garden design is quite cool. 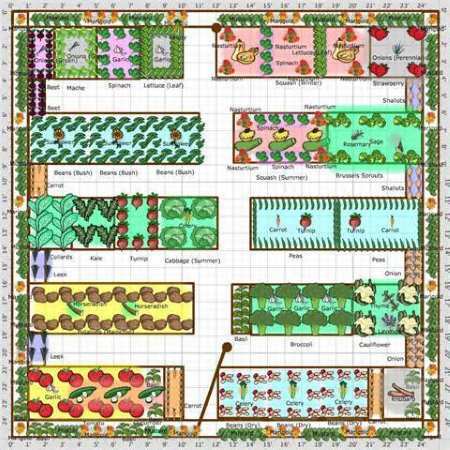 If you like to add flowers to your vegetable garden, then you’ll love this design. They plant a variety of vegetables in the center of the garden. 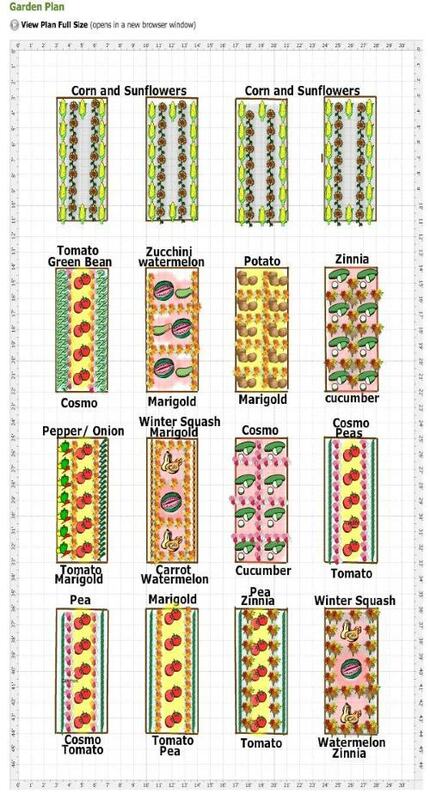 This is great because then you can have more options throughout the growing season. Then they add sunflowers on the ends and marigolds on the sides to add protection for the vegetables and a splash of color too. 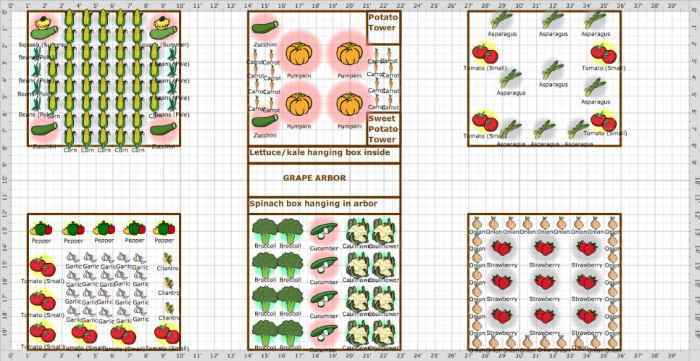 Well, you now have 19 different vegetable garden layouts that could help you to grow a beautiful garden this year. 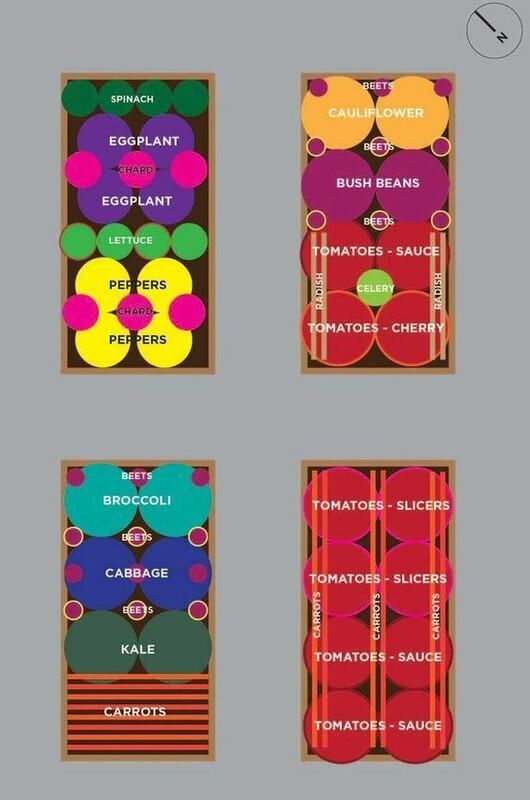 But I’m curious, how do you layout your vegetable garden? Have you found that certain designs work better than others? If so, which ones? We’d love to hear from you. Please leave us your thoughts and comments in the space provided below. 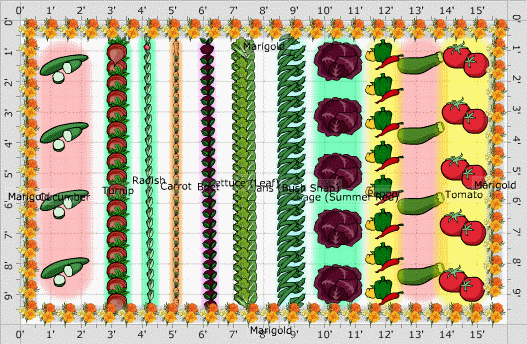 How Much Water Does Your Vegetable Garden Need? Faster loading of planes? Palletize seating. Seats will be mounted on movable pallets in 18 seat modules (9 on one side and 9 on other with center aisle). Have all flyers seated in terminal staging area in seat number order, strapped in, then the pallet is slid into large cargo door opening at rear of plane and then slid to front of cabin and locked in place. Then the next pallet, and the next pallet, etc. All pallets align creating center aisle for service and accessing restrooms at front and back of plane in flight. Arrive too late to get your seat in the pre-loading process? Wait until next flights. For leaving the plane, the process happens in reverse at destination. If airlines treat passengers like cattle, might as well load us like cattle. Excellent article on a very important aspect of growing vegetables – plenty in there to ponder and inspire. Concise, creative and content rich, well done you. One of the best articles I’ve seen on the subject.